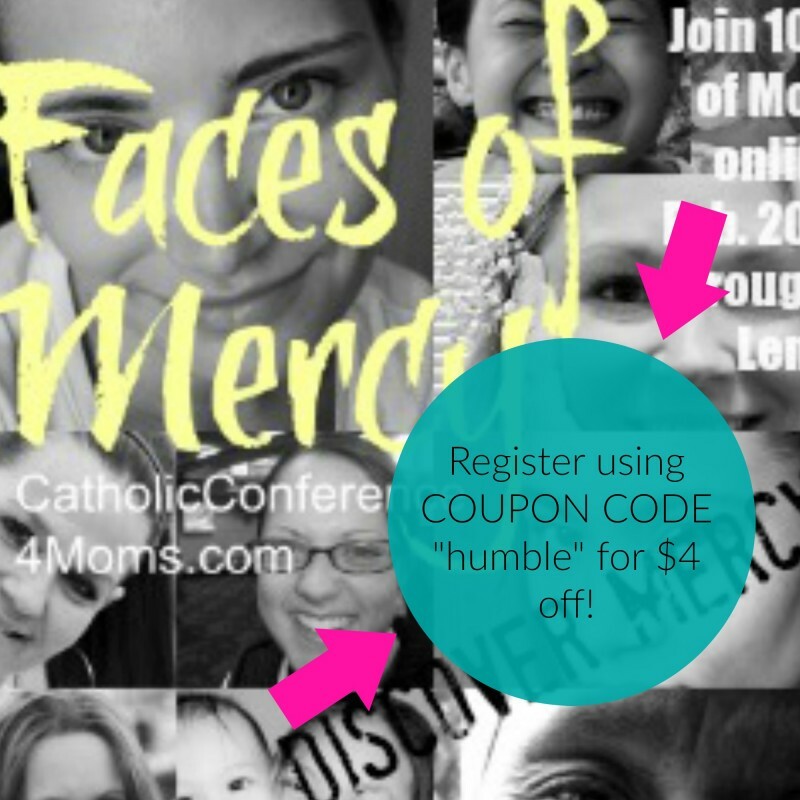 If you didn’t catch the news a few weeks ago, I’m honored this year to be a blogger affiliate for the 2016 Catholic Conference 4 Moms “Faces of Mercy” online conference. The conference opens tomorrow, and here’s why I think you should register–whether you’re a young mom or a grandmother, a father or a person with no children at all! So…what exactly is an “online conference,” you ask? Basically, starting on Saturday, February 20, registered conference “attendees” will have access all during Lent to HD video and/or podcast downloads of 20+ high-quality, 20-minute prepared talks from top Catholic authors, bloggers, and speakers. Attendees also get a digital “swag bag” of more than 35 special coupons and freebies (which I’ve seen a list of, and there are some awesome goodies in there!). Each of the talks is about 20 minutes long. They are a just-about-perfect length for a commute, a laundry folding session, finishing up the dinner dishes, taking a walk around the track at the gym, or watching the kids play outside. Those are some of the times when I’ve been listening to them, at least! Since I’m an affiliate this year, I was actually given the chance to preview the talks for the conference. I watched or listened to four talks this week, and I honestly thought they were really, really good. All of the presenters for the conference weave some aspect of mercy and forgiveness woven into their talk, which pairs perfectly with this beautiful, penitential season of Lent. Are these talks just for moms? Honestly, I’d give this question a resounding no! I think that each speaker probably at least references motherhood at some point because of the target audience of the conference, but these are presentations about mature spiritual truths and topics that any adult Catholic Christian, man or woman, can benefit from hearing. From overcoming anxiety, to setting boundaries with our mercy in difficult relationships, to the work of forgiveness, to Catholic social teaching, to practical ideas for mercy in our marriages, home, and parenting, there is a talk or two in here for just about everyone. If you don’t think you’re in the demographic of this conference, take a quick look at the list of presenters and presentations, and think again. Lucky you! :) I am a blogger affiliate for the conference, so if you use my coupon code, “humble,” at checkout, registration is just $10.99 instead of $14.99. I will receive a small percentage of each registration that uses my coupon code, any and all of which is going straight back to the keeping-the-lights-on costs of maintaining my blog and podcast. I don’t make any money from blogging and podcasting, so Michael and I spend our own money to pay for hosting and upkeep of my websites. We would so appreciate the blessing of this extra help with my growing ministry! I am glad to recommend registering for this conference. I think it’s $11 well-spent for a Lent-full and beyond of high-quality talks to enrich and instruct my spiritual life. There are lots of great spiritual podcasts and radio shows out there (*cough, cough*), but I honestly think it’s a steal to have such a well-produced group of topics and presenters all in one place. Wishing you blessings, strength, grace, and everything you need this Lent. May this special liturgical season prove fruitful for your soul and bring you more deeply into relationship with the God who loves you more than you can imagine. I was so honored to be asked to join the presenters this year – and I AM super excited about logging on tomoorrow at 3 pm to join in the Divine Mercy with all my Sisters in Christ!!! Tami did an incredible job with the conference this year !! The bits and pieces I’ve been blessed to see are awesome!